Plush beds and Great America less than one mile away make the non-smoking Avatar Hotel a special place for guests who also enjoy the free evening wine hour. The four-floor Avatar's 167 rooms feature mini-fridges laptop bed trays iPod docks and flat-panel TVs with premium cable. You snooze you win. The plush beds have pillowtop mattresses and cotton-rich linens with triple sheeting. This is Wine Country after all so the hotel hosts a free evening wine hour. The hotel also has a fitness center and an interactive business lounge outfitted with flat-panel TVs video games and massage chairs. The hotel is less than one mile west of California's Great America and one mile south of the Santa Clara Convention Center. 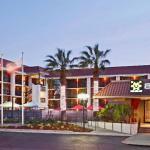 The hotel is five miles northwest of Norman Y. Mineta San Jose International Airport.